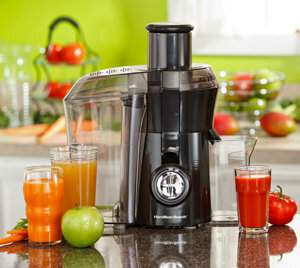 Looking for an ideal juice drink that’s fresh, free of preservatives and tastes 10 times better than store-bought juices? Take the plunge and go with the Big Mouth Juice Extractor from Hamilton Beach. It packs all the punch you would expect from a Hamilton Beach juice extractor: reliable efficiency, high speed and no-fuss cleanup. Rated a “Best Buy” by a leading consumer advocacy publication, the Big Mouth Juice Extractor delivers on the juicing performance people ask for most, instead of skimping out on the nutrients they need. 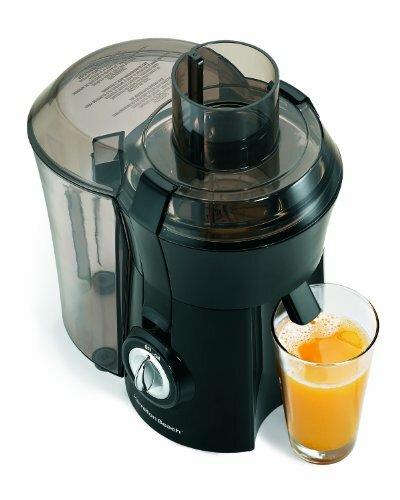 Equipped with a powerful 800-watt motor and extra-wide 3″ feed chute that tears through almost anything you put in, it flawlessly performs the task of extracting the juice from whole fruits and vegetables in seconds. And that’s not all. The designers of Hamilton Beach have minimized the fuss of cleanup, making all the removable plastic parts dishwasher safe. Thirsty for something other than juice? The Big Mouth Juice Extractor can help children, teens and adults get their daily vitamin intake with the option of making soy, almond or rice milk. To start, soak one cup of soybeans, almonds or rice in four cups of water for 24 to 48 hours in the refrigerator, and then slowly pour one cup into the food chute. The liquid extracted from the soaked mixture is “milk.” For enhanced milk flavor, consider adding vanilla or honey.